Sip on sangria this season! These fruit-filled adult beverages feature red or white wine, 100% fruit juice and all kinds of colorful fruit. 1. 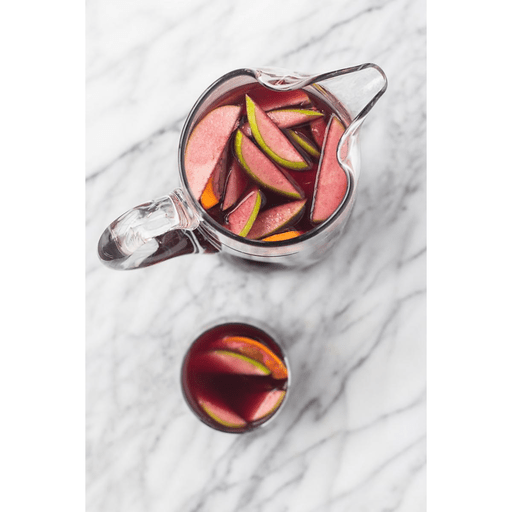 Place apple slices, orange slices, red wine, brandy, triple sec, orange juice and pomegranate juice into a large pitcher. Stir to mix. 1. Refrigerate for 24 hours before serving. Use a dry red Spanish wine, like Tempranillo or Rioja. Per Serving: Calories 190, Total Fat 0g (Saturated 0g, Trans 0g), Cholesterol 0mg, Sodium 10mg, Total Carbohydrate 21g (Dietary Fiber 1g, Total Sugars 16g, Includes 0g Added Sugars), Protein 1g, Vitamin D 0%, Calcium 4%, Iron 6%, Potassium 6% *Nutritional values are an approximation. Actual nutritional values may vary due to preparation techniques, variations related to suppliers, regional and seasonal differences, or rounding.